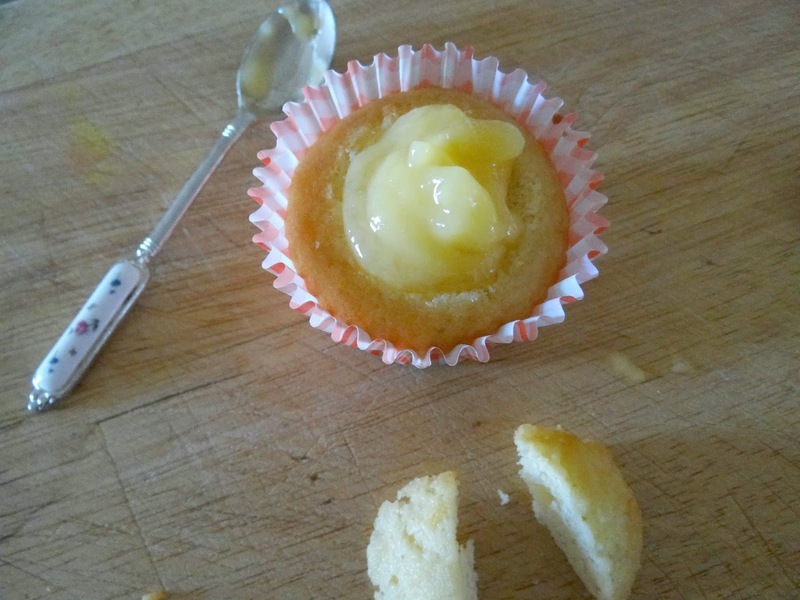 At some stage in their growing up years each of my children have been treated to a sweet feast of butterfly fairy cakes, and whether that be at family celebrations, in a picnic basket or at afternoon tea, these small handfuls of yumminess never failed to bring squeals of joy and wide smiles. Last weekend when we celebrated Cully May's 2nd birthday these delicious cakes made their appearance for the next generation to enjoy, and indeed she did! I had considered baking a 'normal' sized birthday cake and decorating it in lots of pink (or maybe give a Thomas the Tank face a go), but then I thought about those precious little 2 yo hands and what they can hold all by themselves. One entire cake, in pretty pink gingham paper wrapping, butterfly fairy wings high on top, and a sweep of white fairy dust scattered all over...yes, that's what Cully May's little fingers needed to curl themselves around. It's a different mindset to bring your plans in line with the age, ability or needs of another, but so worth it. To see Cully devour an entire 'birfday cake' with sheer delight and total abandonment, the lip licking, laughing chomps and satisfied mmmm when the final mouthful was taken...well, it made this Nana heart glow. 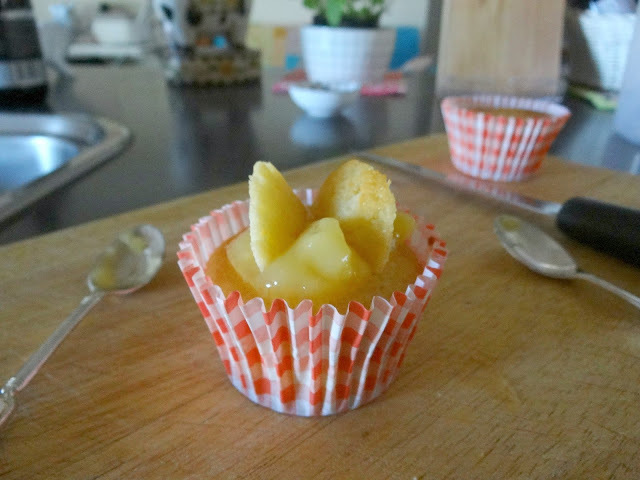 I was surprised to receive a number of requests for this recipe but am very happy to share it. 2. Cut the circle in half to make your wings. Fill the top of the cake with lemon curd, jam or cream. 3. Place the wings on top of the cake and gently press them into the filling. 4. 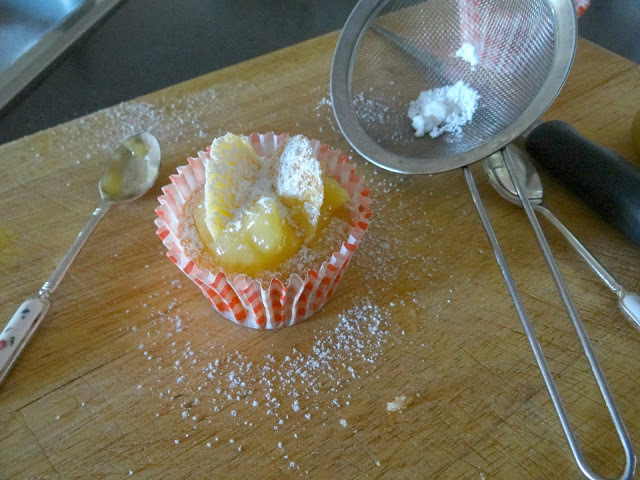 Sift icing sugar (powdered sugar) over the top. 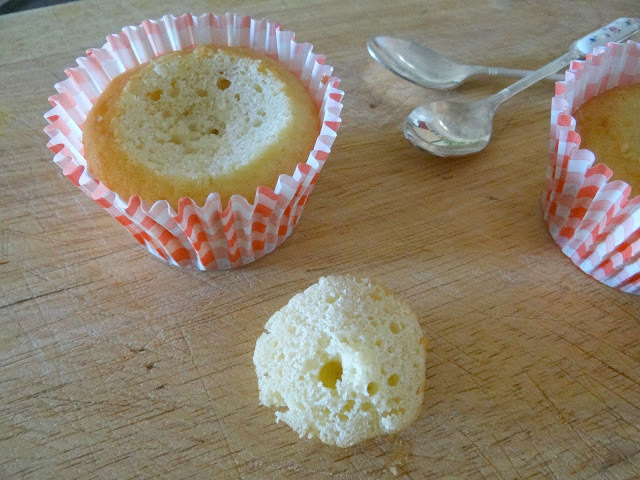 I've shown how to do this with one cake but when you have baked the entire batch (my recipe will make 18 cakes) place the cakes on a wire rack and sift the icing sugar over all of them at once before placing the finished cakes on display. For Cully May's birthday I placed a few cotton laces doilies on a large glass cake plate and displayed the lemon curd fairy cakes around two un-decorated cakes which each had a pink candle. She was very excited and though this may seem very simple to grown ups, those little dimples and wide brown toddler eyes told me it was just perfect for her. After I typed up this recipe last night I went back through my old patterns and found one I'd forgotten about. It has a pretty line of lemon roses embroidered down one side and features a length of elegant lace on front and mother of pearl buttons for the side fastening. 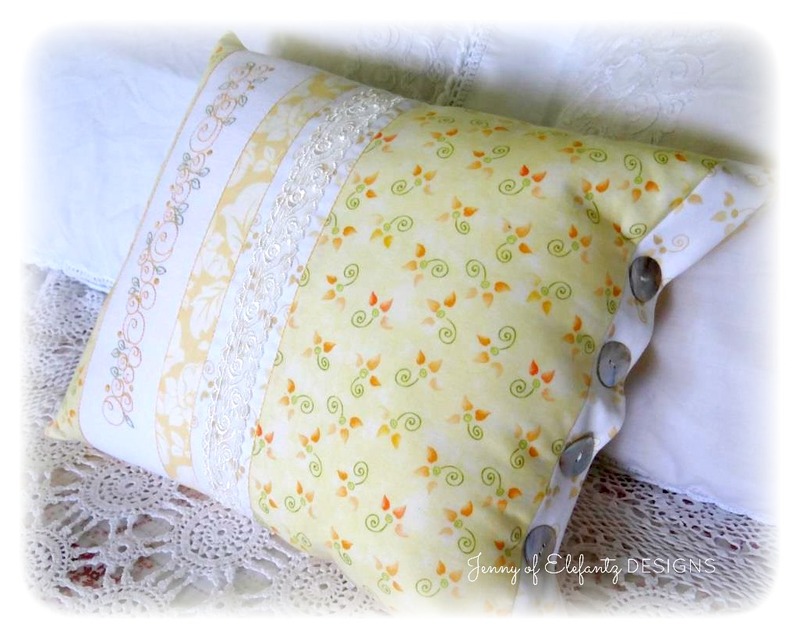 This design did not feature my usual soft pinks, blues and greens - in fact you rarely see me focusing on yellow or lemon when I create, but I really loved making this pillow and the lemon just worked. "Father God, please be merciful and lead us to the right house today." Never underestimate a simple prayer that is prayed from the heart. Because it's not the words you use which matter most to God, it's the heart intent, the need, the humility, and the love for Him. Cully May looks delighted with the cakes. They look luscious Jenny. The pillow is so pretty & delicate. Thanks for sharing these with us. Best wishes for your house hunting journey. I'll be lighting a candle in the Cathedral in Durham for you next week. It's the home of St Cuthbert & St Bede so I'm enlisting their help in finding a home for you! Thank you Jenny for being so generous. Asking the Lord for blessings to you and family. You are always so generous with us. Thank you. Is the house hunting done now? It's always so good to know the power of a prayer doesn't depend on us but the One who is answering. Those butterfly cakes remind me of my childhood! Beautiful! Jenny, those cakes have been around forever and haven't lost their popularity. You make them look so pretty. I hope you find the 'right' house for you this weekend. I am sure God has it waiting for you. I hope you have a lovely time at open houses today and do not feel as stressed as you were. I love the lemon cushion pattern you have kindly shared. A big thankyou. Thank you so much for sharing with us these goodies and beautiful pics. I will certainly try these delicious looking cupcakes with my grandchildren. Have a wonderful weekend house hunting, your home is out there and you will find it. Thank you for this lovely recipe! Love seeing Cully May's excited face - she is such a bundle of joy each time I see a picture of her. Hoping you find your future house this weekend. Hello Dear Jenny; I was delighted to receive an email from you once again. How marvelous Cully May's birthday was with your special cakes! She is just so adorable! Your pillow is lovely. Thank you for sharing both of these wonderful gifts with us. I continue to pray that the Lord will watch over you and help lead you to the home that will be yours. Have a fantastic day! Thanks, Jenny, incredibly simple and looks so delicious. I will try it out next time I have to bring something to a party. =) Thanks so much for the pillow design, too. I just love the look of it, almost as much as the look on Cully May's face. Amen! HE knows the desires of our heart! Thank you for your posts! Every one has touched my heart! 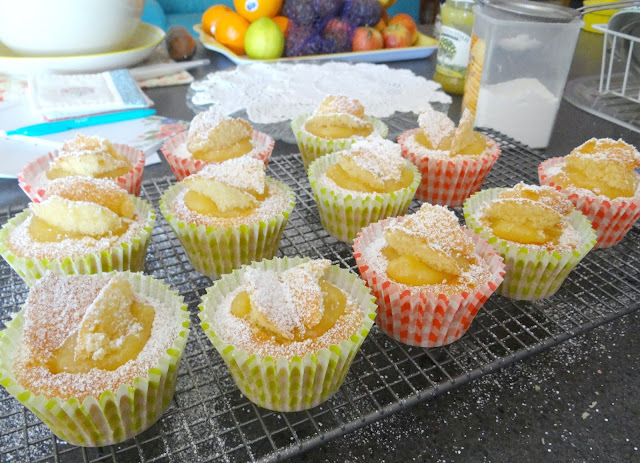 Thank you so much for he recipe for fairy cakes!! As you continue to search for your house to make into your home, my daughter is doing the same thing (except she wants to rent) 3,000 miles from me...my prayers are with all of you to find that special place the Lord has prepared for you. Ooh how pretty - they look delicious and make a wonderful display!!! Love the lemon roses. I'm praying your house is ready and waiting for you to discover it quickly, sweetheart!!!! Thank you for the lovely pattern. 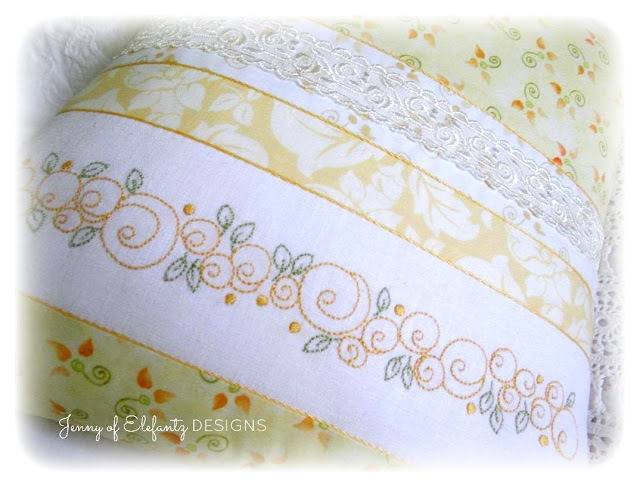 I will be using it as edging for pillowcases. I hope you find a house that says HOME to you.